Give your guns some serious ammo with this intense superset routine. 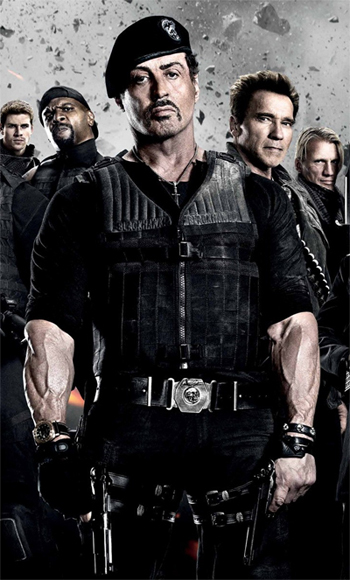 With the Expendables 2 movie now out in theaters, you'll be able to see some of the best arms in Hollywood. Schwarzenegger, Stallone, Crews, Couture, Lundgren and Van Damme will all be putting their massive pipes on full display. So what can you do if you want to load up your guns like an action hero? The following workout is a good place to start. With a combination of bicep- and tricep-blasting supersets, these targeted moves will quickly add size and strength to your upper arms. Be sure that the machines used for these exercises are in close proximity. If you are using the same piece of equipment, it will be beneficial to keep the weight the same. This will ensure that the intensity of the routine is not diminished. Warm up, then perform three working sets. Use the same weight for the biceps and triceps so that you dont waste time changing the weight as this will take away from the intesity of the superset. -Hold an E-Z Curl Bar with a medium grip. The elbows should be close to the torso. -While holding the upper arms stationary, curl the weight forward while contracting the biceps as you exhale. -Continue the movement until your biceps are fully contracted and the bar is at shoulder level, keep the biceps contracted. -Slowly begin to bring the bar back to starting position as you inhale. -Lay down on your back on a bench. -Using a close grip, lift the E-Z bar from the rack and hold it straight over your chest with your arms locked and elbows in. -The arms should be perpendicular to the floor. -As you inhale, keep the upper arms stationary and bring the bar down slowly by moving your forearms in a semicircular motion towards you until you feel the bar slightly touch your forehead. -Lift the bar back to the starting position by contracting the triceps and exhaling.